"This was our second time using Stephanie and she did not disappoint once again. She not only helped us sell our old home above listing price, she also helped us buy our new home at a great price. She always made sure my wife and I knew what was going on throughout the process. She also worked very hard to make sure that everything went smoothly and that things were done in a timely matter. I really felt she went above and beyond her job responsibilities to help us sell and buy our home when the other listing agents would not. I would highly recommend her to anyone looking to buy or sell a house as you will not be disappointed with the service she provides." Stephanie Doherty is an outstanding relator who does and excellent job. We contacted her after unsuccessfully trying to motivate our previous realtor for 6 months to get some movement on the listing. Stephanie was actually on vacation but started the process immediately and had the first buyer while she was still travelling around. She is very committed and knowledgeable. And she knows her business and the other realtor very well. "Stephanie did an incredible job for our family. She sold my parents home with the utmost amount of professionalism, loyalty, organization and care we could have ever hoped for! Her knowledge regarding pricing is right on point and her negotiating skills are unmatched! Stephanie truly loves her business and that devotion shows! From start to finish, she has her hand in the details! I feel blessed to have had Stephanie as our realtor and would highly recommend her services to all." "When we decided to sell our home in Elgin, we conducted a search of local real estate agents. We narrowed that list down to three and met with them. We were immediately impressed with Stephanie, and selected her to be our agent. The other agents we met with were clearly competent, but Stephanie really stood out. Her knowledge of the local real estate market was evident. Throughout the process, at critical points, Stephanie provided excellent, thoughtful advice that we found to be very beneficial. We were out of state during the time our home was on the market, and Stephanie (and at times her husband, Don) went above and beyond to help us work through a couple issues. Our home sold in under two weeks. We could not be more pleased with Stephanie and we highly recommend her." "Stephanie is wonderful!! Always responds and has her clients best interest in mind- she is knowledgeable and conscientious from start to finish! If you like straightforward and honest hire Stephanie as your agent." "We started our home search a few months ago. I was looking at houses on Zillow and was connected with Stephanie. She called me within about 20 minutes, and from that moment, I just felt so at ease with her. She set us up with Laurie, who is everything you'd want in a realtor. She listens, she knows the area like the back of her hand, she is honest with you about the homes, and she never makes you feel rushed or pressured. She found us our dream home and helped us through the whole process. She had advice and recommendations for us at every step, even helped us find an amazing inspector and lawyer. She knows everyone! Buying and selling a home is so stressful but Laurie was always just a text away whenever we had questions. I could go on and on. I told Laurie after closing that I'd build a shrine to her if I could, lol They even gave us a beautiful closing gift that we will treasure. If you are moving to the St. Charles area, this is the team you want to be." "We recently relocated to St. Charles, IL from out of state. Laurie took amazing care of us during this whole process. She devoted many, many hours of her time to not only showing me homes in St. Charles during the weekends I would come to house hunt, but also driving me around town and helping me get a feel for the area. She is extremely knowledgable about St. Charles and the surrounding area and I felt very confident in her recommendations. 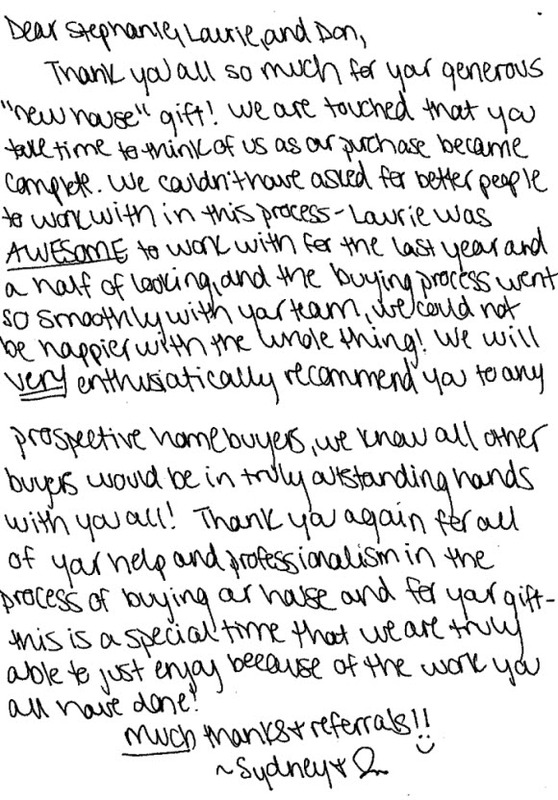 We had a great experience working with Laurie!" "Stephanie is very aggressive in working with her client and is responsive to your questions in working through the process of selling your home. I highly recommend her." "Stephanie,is very professional & knowledgeable. She does her research on the property and knows how to price it. I had multiple all cash offers on the first day it was listed and it sold for well over asking price. I highly recommend Stephanie, who represented me as the seller, Laurie Sundaram, who represented me as the buyer and Stephanie’s husband Don, who handled the mortgage process. It was truly an effortless experience thanks to this great team of people." "Stephanie Doherty is very knowledgeable of the Fox Valley area. She is the realtor you want on your team when you want to sell your home. We have used her as our relator for two homes and she exceeded our expectation both times. Both homes were sold within a very short period of time. She is extremely professional and responsive. She will tell you what you need to hear and know to sell your home! I highly recommend Stephanie!" "I regularly drive by other real estate signs and wonder why they aren't listed with Stephanie. I trust her knowledge. This is the second time I have listed with Stephanie, and I would do it again and again. She will go to bat for you and make sure you are taken care of. You will not regret listing with Stephanie." "My husband and I planned a move back to Illinois and we got in touch with Stephanie Doherty, to help us find the home. We used Stephanie once before, when she listed and sold our home to absolute satisfaction. As expected, Stephanie again proved her knowledge of the Fox Valley Real Estate market, her many years of experience and her negotiational gift! With her help we found a wonderful home for us, where we will live very happy. Having Stephanie to help you buy or sell is the best asset you can have!" Stephanie was instrumental in insuring all aspects of the property listing and sale process were focused on maximizing the value/sale price of our home. From specifics on addressing how our home presented to a potential buyer to the final negotiates on price and terms, Stephanie's efforts, knowledge and professionalism was a major difference maker. Stephanie was able to grasp our sense of timing and manage the process to ensure our target pricing and goals were met. Stephanie and her team's efforts were the catalyst behind receiving and acceptable offer in less than 6 weeks from our initial listing date. We have sold 4 homes in our lifetime and this was by far the best experience of all 4. This is directly attributed to Stephanie and her prowess and unparalleled knowledge in the St. Charles area market. I have spent much of my career managing and coaching sales representatives who were responsible for selling high dollar ($250,000+) capital goods. I knew the type of sales talent I was looking for when we made a decision to sell our St. Charles, IL home. After a on-line search and several personal interviews we decided to use Stephanie Doherty as the realtor to sell our home. Stephanie made an excellent presentation of her skill set and she impressed me as being knowledgeable of the local market and sales process, a good communicator, a hard worker, organized, tenacious and motivated to get results. Her team presented our home well with professional photos and a value added description. Within several days of posting the listing we received an offer for our home. Stephanie skillfully guided us through the negotiation process. She was also very helpful in assisting us in addressing several questions that arose during the home inspection and appraisal processes. The sale was completed in less than 30 days from the listing date to the close date. I would definitely strongly recommend Stephanie as a realtor to anyone selling their home in St. Charles or the Fox Valley. "Stephanie was amazing to work with. She was extremely knowledgeable and she was able to sell our home in record time! Any time we had a question for her she was extremely prompt to respond and she was genuinely happy to speak to us. I highly recommend Stephanie. (Her husband Don was a pleasure to work with as well:)"